High blood sugar can damage internal components of human body such as the nerves and blood vessels that do have connectivity to the foot. People with increased sugar levels have high risk of developing foot related issues such as pain and swelling. Today there are diabetic shoes available in the market that can promote healthy blood circulation in the human feet. Diabetic shoes are of different categories and due to increase in the customer awareness for the healthcare products and the trending designs of these therapeutic shoes, the market has gained significant traction in the past years. The report “Global Diabetic Shoes market” for the projected period 2016 to 2021 has been segmented on three different parameters. The global Diabetic Shoes market has been primarily studied on the basis of demographics. The Diabetic Shoes market has also been studied on the basis of different categories such as Athletics, Sandals and many more. The market has also been studied on the premise of different geographies based on the data obtained from the primaries and secondary research conducted amid the report formation. Middle East and North America are the mature market for diabetic shoes as per the initial estimations as per the initial research results. This can be attributed to the presence of the highest number of diabetic patients in countries such as Saudi Arabia, Yemen, Iraq and USA. The level of awareness for these medical products in the customers present in these regions is considerably higher than the Asian and European customers. This difference of awareness can also be accounted for high purchasing power and use of advanced marketing channels used by the companies in the developed geographies. The increasing number of aging population and diabetic patients in the Asia-Pacific and European countries is laying down grounds for the growth of the diabetic shoe market in the coming years. 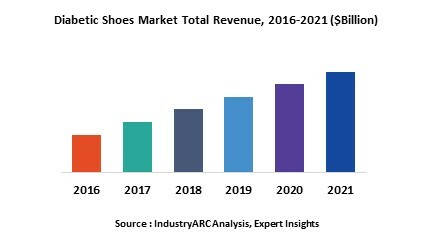 However, the global Diabetic Shoes market is being restrained by factors such as low branding and marketing of diabetic shoes and also because of the stringent barriers and regulations for entering this particular market. The Diabetic Shoes market report also comprises of the leading companies profiled in an extremely descriptive manner. The company profiles include financial summaries, strategies, recent developments and product portfolios of the leading companies in the Diabetic Shoes market. The report also incorporates a profound study of the market entropy, market forces and strategic analysis of the Diabetic Shoes market.